Mayor to Citi Bike: Take your time. The de Blasio administration is apparently not moving towards collecting nearly $1.4 million in fines it could levy against Citi Bike for the calamitous mini-collapse this month of the bike share system, which is required by contract to have 97 percent of its 12,000-bike fleet available at all times. 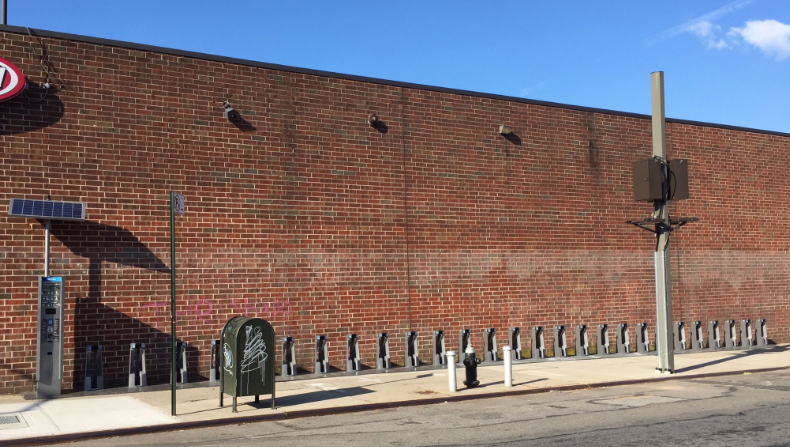 The bikes have disappeared from the Citi Bike system due to repair work that the company announced this week after Streetsblog revealed the massive shortfall. On Friday, only 57 percent of the fleet was road-ready, the lowest this month, down from 59 percent from earlier in the week and down from 72 percent at the start of the month. Fine print in the contract requires Citi Bike to meet a dizzying array of “service level” benchmarks for its bikes and its docks, such as making timely repairs, properly cleaning the equipment and responding promptly to concerns. The contract stipulates a penalty of $15 per bike per day per day whenever the fleet level declines below 97 percent. Doing the math, the contract requires 11,640 bikes to be available. Using the company’s own data, Citi Bike’s parent company Motivate failed to reach that level of service every single day in September, falling short by as little as 2,344 bikes on Sept. 1 to as many as 4,860 bikes on Sept. 28. Gastel did not answer Streetsblog’s other question, however: Whether city officials were aware of Motivate’s repair problems before Streetsblog broke the story on Wednesday, forcing the company to go public. The contract says that DOT Commissioner Polly Trottenberg can ignore fleet level standards if she wishes, so Trottenberg may have done so when Motivate first discovered the handlebar flaw behind the repair crisis. DOT did not respond to a question about whether Trottenberg approved the reduction in service level in advance of the crisis. Motivate has also declined to comment further, sticking with its original statement to its 145,000 members. A source did say that more than 75,000 rides were taken on Citi Bikes on Thursday, close to the system’s 80,000 record. The repair crisis comes at a sensitive time for the nation’s biggest bike share system, which is owned by Lyft. The city and Motivate have struggled to expand the program beyond its inner Brooklyn and Manhattan core, even as the bike share industry is growing thanks to dockless systems such as Lime and the Uber-owned Jump. Pilot programs in the Bronx, Staten Island and the Rockaways have shown mixed results, however, buying Citi Bike more time. This story was updated on Friday, Sept. 28 at 8 p.m. to reflect new information from DOT. My understanding is that NYC hasn’t enforced this provision. My understanding may be wrong. How does the foregone parking meter revenue compare to the potential fines NYC might attempt to collect from NYCBS? I commented then it was unclear — at least to me — who will own what and who’s responsible for what. It remains unclear. If I’m reading this right, 97% is the default bicycle fleet level, but it is supposed to be changed periodically. Is it 97% right now? It’s possible that the level has been lowered precisely because of the identified handlebar defect. Right. Unless there’s some kind of corruption or gross negligence, I’m not sure what the point would be. A while ago I spoke to a guy at a Citibike station whose son had worked 9 months in their maintenance dept. He said that the whole operation was a disorganized shambles, and he ended up leaving because it was such a joke. “Motivate” them to change their ways so that there’s less chance of it happening again? Removing their monopoly and legalizing dockless would. No, no, no, don’t go dockless. In Los Angeles dockless sidewalkers are left all over the city and the city does not have the person power to pick up walkers left in streets, drive ways, side walks, etc., Make laws before the fact not after the fact! -Dedicate public space to vehicle parking, preferably one parking space per block and expand as needed. (While we are at it, remove a parking space on each block for a trash collection dumpster). -Fine the company per instance of “littering” as you would with any rental car. You’re no Fool, excellent ideas. Citibike has been run terribly with novice staff. I’m not sure how Justin Ginsburg didn’t get fired for mismanaging it, and now for some reason the guy gets a job working with the airports. The City needs to make sure they are adhering to their agreement but the real issue is the staff at the Mayors office is a joke on so many levels when it comes to policy making, and making sure their vendors are held accountable. I’d be curious to know what the contract provisions (and shortfall numbers) are for bike redistributing because the docks in much of downtown Manhattan are rarely restocked and it was nearly impossible to find a bike in large swaths of Chelsea and the West Village in July, August and September. The system is struggling to get back to full force — though usage numbers remain high. Not so fast! Citi Bike's speedy electric-assist bikes will remain grounded for the foreseeable future. The operators of the popular bike share system admit their problem.